As an organisation we work with financial institutions to understand how they are working to improve their digital business. We found that there was a substantial lack of knowledge when it came to blockchain and distributed ledger technologies and how they could be utilised within financial services. The conference will have moved from hypothetical discussions in 2016, to how companies are now moving their blockchain projects into production. As well as this amazing content, we will also host a technology/ICO pitch event on the evening of October 2nd at Dogpatch Labs on the evening before the conference begins with Guinness and Pizza! 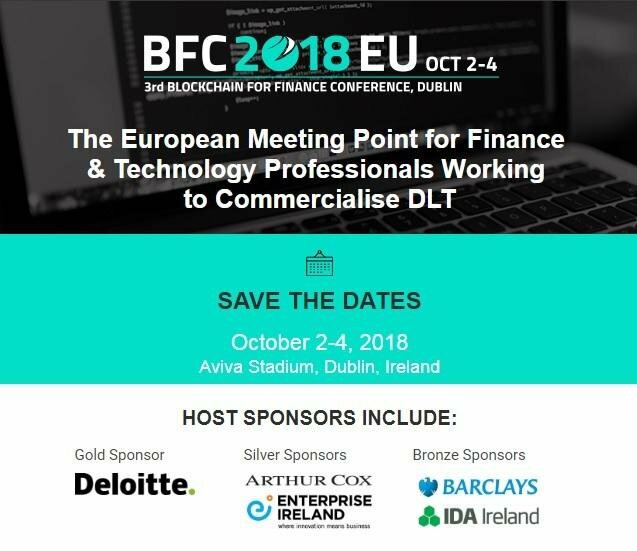 As part of the conference this year we will have an exhibition area with more than 20 booths to help start-ups, investors and institutions to showcase the latest work they are undertaking with blockchain/DLT. Richard Crook, Head of Emerging Technology, RBS ?